Hanoi (VNA) - The Trans-Pacific Partnership nations have made progress toward a new free trade agreement slated for November following the US withdrawal from the pact, according to Japanese chief negotiator of the Trans-Pacific Partnership Kazuyoshi Umemoto. Umemoto was quoted by Japanese news agency Kyodo as saying so to the press on September 22 after two days of negotiations in Tokyo. 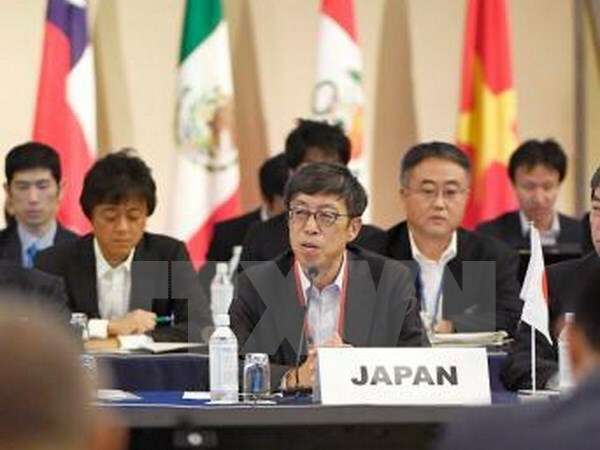 He also said chief negotiators of the 11 TPP member countries agreed to meet again next month, adding that they aim to clinch a new deal at the Asia-Pacific Economic Cooperation (APEC) Economic Leaders’ Meeting in Vietnam in November. During the latest round of negotiation, three working groups on legal, intellectual property and other issues discussed member countries’ requests for freezes on parts of the original agreement, particularly clauses introduced at the US request. The TPP was signed in February 2016 by Australia, Brunei, Canada, Chile, Japan, Malaysia, Mexico, New Zealand, Peru, Singapore, the US and Vietnam, covering around 40 percent of the global economy.